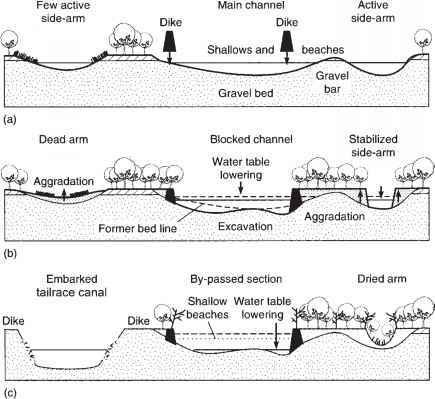 We are now familiar with many of the principal features of streams, including the shape of their channels, the lateral connection to the flood-plain, the presence of riffles, pools, and meanders, and the sediments of the streambed and its banks. These features vary along the river's course from headwaters to lowlands, and with regional differences in climate and terrain. As stated earlier, streams seek a state of dynamic equilibrium between the imposed conditions of valley slope, discharge, and sediment supply, and channel adjustments that can include width, depth, velocity, reach slope, roughness, and sediment size. Over historical time, the channel adjusts to changes in discharge and sediment supply due to human activities, climate change, and extreme events. Increasingly, today, it is human activities that destabilize the rivers' equilibrium, often triggering a series of changes that pose problems for our built environment. 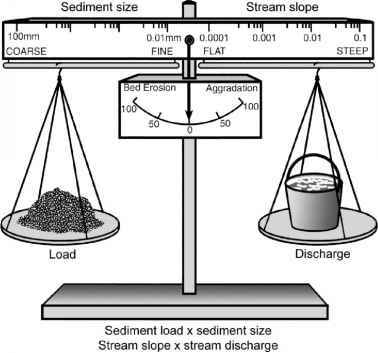 where Qs is the sediment discharge (load), D50 is the median particle size, Qw is water discharge and S is slope (Lane 1955). The relationship is qualitative, hence no units are given. It implies that the channel will remain in equilibrium as long as no major change occurs in any of the variables, or if changes in one are balanced by changes in another. Equation 3.6 is especially useful for envisioning how a stream will respond to human actions. If sediments are trapped behind a dam, the outflow usually has a low sediment load, resulting in bed coarsening and channel incision as the sediment-hungry river entrains bed material and downcuts. If sediments are introduced by poor land use practices in a tributary catchment, the stream lacks the power to transport that additional material, resulting in deposition and aggradation. If a stream is straightened, its slope is increased (because the same elevation drop now occurs over a shorter distance), and erosion is expected. When as little as 10-20% of a catchment is covered with roofs, pavements or other impervious surfaces, peak discharge typically increases and channels typically widen or deepen in response, a familiar sight in urban areas (Bledsoe and Watson 2001). We now turn to a process-based analysis of river channels, linking the governing conditions of water and sediment supply to the channel features we have encountered and their changes along the river continuum. This will focus primarily on alluvial channels, defined as those with bed sediments that are transported by the stream. Rearranging Equation 3.6, it is apparent that sediment transport is directly related to stream power (Qw S) and inversely related to grain size D50 (also referred to as sediment caliber). 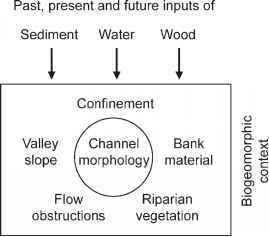 The interplay of a stream's capacity to transport sediment with the input of sediments and their caliber results in distinctive channel morphologies (Church 2002). Bank strength, which is influenced by sediment texture and vegetation (LW), and other channel constraints, exerts additional influence over channel shape (Figure 3.12). deposited, forming an alluvial channel and a floodplain. Material from this section is transported onward, and replenished from upstream, in episodes of erosion and deposition. In large lowland rivers near the distal end of the drainage system, sediment deposition is dominant, resulting in large floodplains, alluvial fans, and deltas. A series of interrelated changes in streamflow and sediment character occur systematically along the river's length. As previously mentioned, channel gradient declines and stream discharge increases. The discharge-slope product, stream power, is greatest in the midrange of the river system. Sediment grain size is largest in the headwaters, where large clasts introduced from hillslopes often have diameters equal to or greater than bankfull depth and are immobile even at highest flows. Smaller material is transported downstream in cycles of erosion and deposition that sort particles and carry farthest those of smallest size. Hence characteristic sediment size becomes finer as one proceeds downstream. Sorting of stones also can result in predicable arrangements that enhance their stability. Gradient and relative roughness (grain diameter divided by depth) can be combined to predict specific details of bed morphology (Montgomery and Buffington 1997, Church 2002). For example, the pool-riffle sequence of gravel-bed streams, with point bars at bends, typically occurs at a slope near 0.01-0.03 and a relative roughness near 0.3. Near the downstream terminus, sand-bed channels are found; because of their small grain size, bed material is mobile over a wide range of flows. Visually this can produce a pleasing picture of ripples and dunes, but for most organisms bed instability makes a hostile environment. As Benke et al. (1985) have shown, most biological production in sand-bed rivers is associated with submerged wood, the only stable habitat for invertebrates. TABLE 3.3 A classification of channel-reach morphology for mountain drainage basins recognizes seven distinct reach types. Colluvial channels typically are small headwater streams, receive their sediments from hillslopes, have clasts that are large relative to stream depth, and have insufficient power to transport large boulders but rapidly deliver smaller particles to lower-gradient channels. Bedrock streams have a low sediment supply relative to transport capacity. 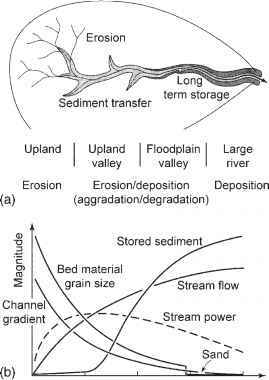 The five alluvial channel types commonly occur in a downstream sequence of decreasing fluvial transport capacity relative to sediment supply. See Montgomery and Buffington (1997) for further details.